“But, why do you want to write a biography of René Le Bègue? Nobody cares.” This was the encouragement I got from highly respectable writer Donald Davidson, official historian of the Indianapolis Speedway. It is true that René Le Bègue has been forgotten. First, there’s his name. It doesn’t quite sound like a champion’s name: le bègue means ‘the stammerer’ in French. Yves Courage sounds better already, even if he isn’t a World Champion. Italian, Brazilian or Anglo-American names are ideal racing driver names but René’s last name can make a French racing fan smile. Moreover, he raced before World War II. Nowadays many people have the feeling that racing was created in 1950 with the start of the World Championship. But what about the pre-1950 races? Fortunately, for some years now, people have been taking some interest in pre-war races, thanks to specialized magazines and websites (like 8W…). Nevertheless it is difficult to give pre-war drivers the fame they need for their rightful place in history. Just think about Jean-Pierre Wimille whose first biography was written in 2002, 56 years after he died. Now, let’s take a look at René Le Bègue, this 1.66-metre puny dandy who incidentally was declared unfit for military service. This guy did not have the appearance of a sportsman but in spite of it was really talented. He was very young when he began racing, at least compared to most other rookie drivers of the thirties. It was in 1935 and he was only 21 years old. Very soon he won his first rally before switching to sports car racing with a Delahaye 135S. He had good results with this car, in his first season on the circuits: 5th in the Marseille 3 Hours, second in the Spa 24 Hours, 4th in the Comminges GP. Moreover, he set fastest lap in Ards, Ireland, during the Tourist Trophy. This best lap has never been beaten. In 1937 he began the season with a beautiful victory in the Monte Carlo rally at the wheel of a Delahaye. It was his last drive with this constructor as he chose to continue the season with Talbot. He made some progress and despite a serious accident during the Mille Miglia he was back racing three months after the Italian event. His comeback took place at Reims, for the Marne GP, where he finished 3rd. Not too bad. Then he finished second in the Tourist Trophy at Donington and won the Speed Cup at Montlhéry. René Le Bègue was filling out. In 1938 he continued with Talbot. He won some minor races (the Lyon-Chamonix rally and the Paris Cup at Montlhéry) and was second in the Paris-Nice rally, having become one of the specialists at the event. 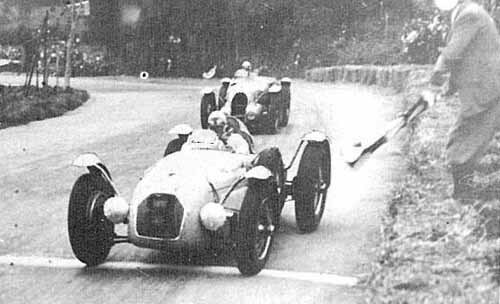 But his second great victory, following his Monte Carlo ’37 glory, was the Paris 12 Hours race at Montlhéry, where André Morel was his co-driver, with both men taking turns at the wheel of a Talbot T150C. It was Le Bègue’s first circuit victory. Now René Le Bègue could be taken seriously. Then came 1939. He was often on the podium (La Turbie hillclimb, Paris Cup, A.C.F. GP) but it was right at the end of the season again that he scored a great victory, surely the most important one in his very short career. 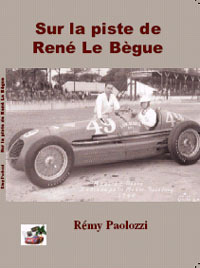 After a race which was qualified by Charles Faroux as the “the most beautiful race ever”, René Le Bègue won the intensely fought-over Comminges GP. He won his battle against Wimille and put Sommer at a distance. Thanks to this victory René finished third in the French Drivers’ Championship, behind Sommer and Wimille. Le Bègue was among the stars. Then came the war. At first he did not really take part in the conflict and, to keep on racing, went to the States where he competed in the Indianapolis 500 with René Dreyfus. Then, in 1942 he integrated into the Forces Françaises Libres to fight the Nazi invaders. The war ended when he was 31. He was promised a great future in motor racing. Unfortunately, sometimes life ends up tragically and even stupidly. Le Bègue’s life ended in his bathroom where this little man and great driver was asphyxiated by carbon monoxyde. His racing career was too short as it lasted about five years. While I was reading his results, his races and his exploits I wondered why we had forgotten René Le Bègue. In an attempt at answering this question I tried to look for him through photos, articles (I spent so many days in the French National Library!) and letters with specialists. The result of this search, this investigation, is his biography. A French editor, Les Editions du Palmier, kindly accepted to publish it. If this book can remind us of who this French talented racing driver was then my goal is reached.